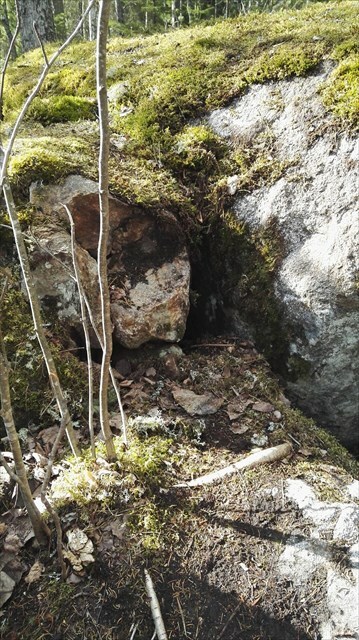 The first finder of this cache (FTF) is tasked to make the next cache in the series, within a two week time period, somewhere within Vaasa. The making of the next cache is completely voluntary and the next maker is free to choose in which part of Vaasa the cache will be hidden. The next cache in the series has to be inside the boundaries of Vaasa and have something to do with that particular area. If the FTF’er does not want to make and place a new cache then he/she should ensure that another finder of the cache is willing to continue the series. If the next cache in the series is not published within two weeks then the original series creator(VaaRPsto) will either make the next one themselves or arrange or someone else to continue the series. The next cache in the series can be a traditional, multi, mystery, letterbox or whereigo. Melaniemi on osittain 1980-luvulla rakennettu omakotialue Vaasassa. Vaasan kaupunki osti metsät Strömberg Oy:ltä ja myi ne omakotitonteiksi. Alueella on edelleen paljon luonnonvaraista metsää ja hyvät ulkoilumahdollisuudet. Matkaa Vaasan keskustaan on noin viisi kilometriä. Vaasan kaupunginhallinnon tilastoalueista Melaniemi kuuluu Huutoniemen suuralueeseen. Vuonna 2013 Melaniemen alueella oli 1886 asukasta. Kätkö sijaitse uusia kerrostaloja ja Kaarlentupa palvelutalon välillä olevalla metsä.